Export content as SCORM packages for Moodle, Canvas, Blackboard, etc. As with most authoring tools, you can export Coassemble Lessons and Quizzes as SCORM packages. This will give you a ZIP file that you can upload into your LMS. Unlike most authoring tools, Coassemble is a cloud product, and as such the ZIP file actually only contains pointers to the Coassemble app, so you'll only ever have to download/upload the ZIP file once, even if you modify the lesson or quiz. To export a SCORM object, simply head over to the Share tab. 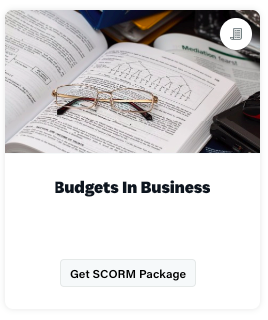 Select a resource you want to export and click the 'Get SCORM Package'. Coassemble SCORM exports follow the SCORM version 1.2 specification. If your LMS asks you what version the package it uses, you should answer 1.2. All packages will record the amount of time the learner spends on the resource. Quizzes will report the student's score (as a percentage) at the conclusion of the quiz. Lessons don't give you a score in the Coassemble LMS, but via SCORM they do. If your lesson contains checkpoints, the package will report a score as a percentage of the completed checkpoints each time the learner completes a checkpoint. The package will also report that it is completed when the student has completed every tile. The SCORM package manifest file contains a Master Score, which is set to 100%. Different LMS's respond to this in different ways, but most will take this as the score required to pass. Most LMS's will allow you to override this value with your own preference. We can't change the value in the file. Your LMS might consider the Lesson completed once a score of 100% (or less if you've customised it) is received, or it may wait for the package to report completion of every tile.